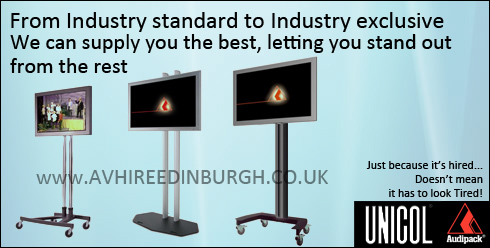 Looking for AV equipment hire Deals in Edinburgh? We offer a wide range of equipment and services below are some of our current special offers available to any customers looking to hire AV equipment in Edinburgh. Please note these deals are available for delivery within central Edinburgh, if you are slightly out of this range please call us and we will create a custom deal for you. 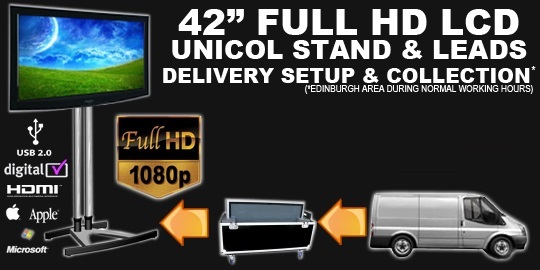 THE CHEAPEST IN EDINBURGH - We are now offering a budget 42" screen rental package for customers. Our latest technology Full HD 1080p packages boast great connectivity and are the perfect solution for cheap signage at events or exhibitions. Including VGA for Laptops HDMI for Bluray DVD players / PS3 and USB for quick slideshow presentations. FREE UNICOL SHELF HIRE WITH ANY LAPTOP HIRED WITH THIS PACKAGE. This Massive 12x9ft Projection hire deal is brilliant for Movie nights, Football matches on TV and of course Nintendo Wii. 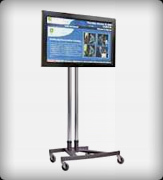 It can be used both as a front or rear projection screen. Be quick to hire for any big sporting events! Price Excludes Delivery Setup and collection.